The defending national champion again eliminates Texas A&M in the regional semifinals, 87-80. CHICAGO — Consider this a sweet repeat for Notre Dame. 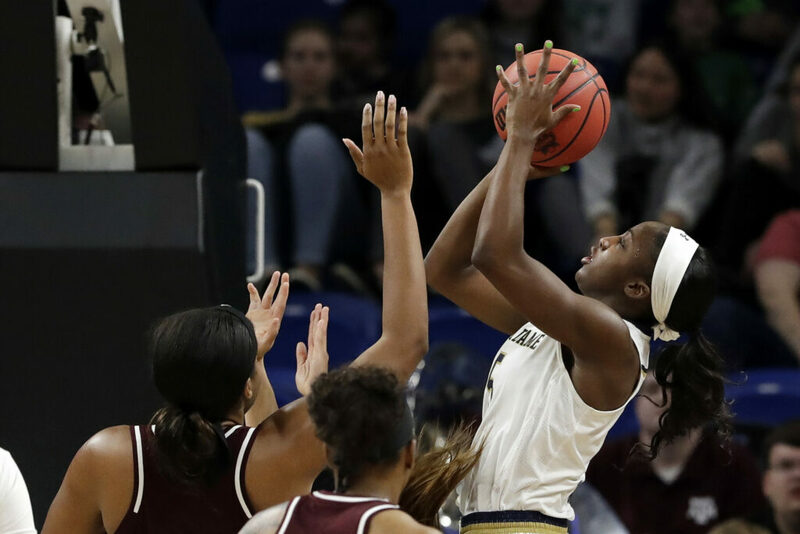 Arike Ogunbowale scored a career-high 34 points, Jessica Shepard added 24 points and 14 rebounds, and the defending national champion Fighting Irish beat Texas A&M in the Sweet 16 for the second straight year, 87-80 on Saturday. Ogunbowale, last year’s Final Four hero, scored 24 points in the second half. She had 12 in the final 6:45 to help the top-seeded Fighting Irish (33-3) advance to the Elite Eight of the NCAA tournament for the eighth time in nine years. They will play No. 2 seed Stanford or 11th-seeded Missouri State in the Chicago Region final on Monday. Ogunbowale, the Irish’s career scoring leader, surpassed her previous high of 32 points. Shepard dominated down low, and Notre Dame scored another tournament knockout over the Aggies with its 12th straight win. Chennedy Carter led Texas A&M (26-8) with a season-high 35 points in another impressive performance, though she took 34 shots. The sophomore guard came in averaging just over 30 points in five career NCAA tournament games and had the touch from long range, nailing 7 of 12 3-pointers. STANFORD 55, MISSOURI STATE 46: Alanna Smith and Stanford outlasted Missouri State, sending the cold-shooting Cardinal back to the Elite Eight for the third time in four years. Stanford shot a season-low 25 percent (17 for 68) in one of its worst offensive performances of the season. But Smith and Anna Wilson supplied just enough scoring, and the Cardinal used their superior length to hold the 11th-seeded Bears to 25.4 percent shooting (16 for 63), also a season low for the last double-digit seed still in the tournament. Smith had 13 points and six rebounds. Wilson, the younger sister of Seattle Seahawks quarterback Russell Wilson, scored seven of her 11 points in the second half. BAYLOR 93, SOUTH CAROLINA 68: Top-seeded Baylor (34-1) reached the Elite Eight for the fifth time in six years with another dominant performance, leading by as many as 30 points in a victory over the fourth-seeded Gamecocks (23-10) at Greensboro, North Carolina. Didi Richards scored a career-high 25 points, and Lauren Cox added 17 points and 14 rebounds for the tournament’s No. 1 overall seed. The Bears shot 52 percent to win their 26th straight game and blow out South Carolina for the second time this season. Kalani Brown had 18 points and 10 rebounds, and Juicy Landrum and Chloe Jackson each finished with 12 points for the Bears (34-1). Baylor will play second-seeded Iowa (29-6) on Monday night, with the winner advancing to the Final Four. Behind the elite front line of the 6-foot-4 Cox and the 6-7 Brown, the Bears dominated both the lane and the glass. Baylor built a 54-30 rebounding advantage, held the Gamecocks to two second-chance points and outscored them by 30 in the paint. Te’a Cooper scored 17 points and Mikiah Herbert Harrigan added 16 for the Gamecocks. IOWA 79, NORTH CAROLINA STATE 61: Megan Gustafson had 27 points and 12 rebounds to lead the second-seeded Hawkeyes (29-6) past the third-seeded Wolfpack (28-6) in the Greensboro Regional semifinals. Hannah Stewart added 16 points and 10 rebounds. Gustafson, who averages a Division I-best 28 points while also ranking second in rebounding, finished with her 33rd double-double to match the NCAA’s single-season record. She made 10 of her 13 shots. The Hawkeyes (29-6) earned their first Elite Eight appearance since 1993. Iowa shot 54 percent and took command by hitting eight straight shots during a Gustafson-led 20-8 run that came after N.C. State pulled to within five midway through the third quarter. Alexis Sevillian bookended the burst with 3-pointers, with the second of those giving the Hawkeyes their largest lead to that point at 63-46 with 8 minutes left. Freshman Elissa Cunane had 14 points and 11 rebounds, Kiara Leslie had 16 points and DD Rogers added 12 points for the Wolfpack, who shot just 35 percent.